[Disclaimer] I will be talking a lot about Apple products during this review. I have a lot of them and if these apps and tools I have become accustomed too existed on other devices, I’d be sure to be purchasing outside the Apple brand. I have no loyalty to Apple other than their expensive tools work for me better than other stuff …Oh, and their ‘Dealers’ have dug their talons in deep. I’ve not had my 64 gig wifi iPad mini that long, but in the last few days I’ve probably used it more than I have my iPad 3 in the last month.Why is this? It’s the form factor really. I use my iPhone pretty heavily, mainly for content creation, but the small screen limits my online interaction when it comes to reading other peoples work and efficiently commenting on social spaces. 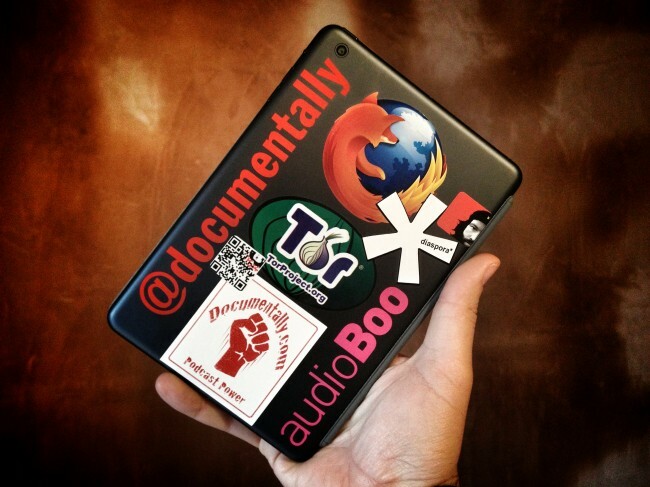 When I travel I take my 11″ Macbook air and my iPad 3. Or at least that’s what I did. The last two trips abroad I left my iPad at home and although I noticed a huge difference in my carry on luggage as well as having less of a hassle lugging it in the day, I missed it in the rare occasions I needed to write long form or research the web while out. The iPhone needs some pretty hefty battery backup to last a day as it is. Normally my Mac Air sits at my hotel or base for any heavy audio/video/photo editing and the iPad joins me in the day. I have been experimenting with remote working solutions using tablets for years now and although back in 2010 Steve Jobs said 7″ tablets were dead in the water, I’m glad the normally untouchably smug Apple have back peddled a bit. I won’t list all my findings here as I have already recorded them in audio embedded below. Not as high resolution as other devices designed specifically for reading. Bit slow for heavy gaming. No GPS on the wifi only version. Great to hold and surprisingly good for typing on. Screen size is bigger than you would think. Has all the iPad functions in a smaller package. As a foot note, I’d love to hear from you if you’ve have had success transferring audio files to and from the iPad. Especially from a memory card. Ultimately I’d like to import audio like I do photos and video. This in many ways is the missing link for me needing a laptop out in the field. The suspicious side of me thinks Apple don’t want me to work solely with a tablet. A great blog post and another informative Audioboo. One point you brought up in the Audioboo was the inability to get audio into the mobile app. You mentioned working with GarageBand while on the move, it’s second nature to most of us mobile audio users, so why not be able to get content from GarageBand or other audio editors to Audioboo? It seems like such a simple function to be missing. One option would be for Audioboo to integrate Sonoma Wire Works audio copy/paste into the iPhone or iPad app. Admittedly most of the apps that use copy/paste are music making based like synths and drum machines but there is also a good selection of multitrack apps the could be used for journalistic work. Having the ability to edit and then post straight to Audioboo would be a distinct bonus. So who would use such a feature? Journalists for a start. Record, edit, add idents and music or ambient beds and get the story online, complete. How about musicians or their PR’s? Imagine recording into an iPad live from the desk at a gig and getting a promo online before the artist has finished to promote a forthcoming release. It’s all possible for professionals and amateurs alike who want to be more professional sounding. At least it is if one wants to carry a Mac or Pc around. Everything is about being mobile, instantaneous and having the ability to communicate with clarity. There is an app for everything but not one with a name like Audioboo that one can paste edited audio to. Soundcloud took another route and allowed apps to add their service to apps so that one can post audio online but who wants another app full of features when you’re on going to use just one of them? In my opinion Audioboo needs the ability to paste in audio. The one downside might be that people would use it to move copyright material around. Maybe but they’d need to get that audio into the editing app and if you were really intent on doing that why not wait until they get home and upload a file to Audioboo through their browser. The answer I think is to add it to Pro Audioboo accounts and offer it as an in-app purchase to the standard app. Get a price point that would deter casual misuse of Audioboo but not so expensive that no-one would invest. I think if it were offered people would use it and the results themselves would make Audioboo as a platform much more attractive for even more people. Come on Audioboo, it’s time to take the initiative. In case you were wondering I have nothing to do with Sonoma in any way, I’m just an audio-head and musician that would like to see more apps and platforms working together. Epic post. Thanks Miki. You make more than a few great points and hit the nail on the head when talking about uses for journalists. I am asked often if it’s possible to work with just a tablet. Commenting on how they feel chained to their laptops in the field they add it would be great to work solely from a phone and keyboard. The screen limits both the swift compiling and editing of text, photos and video and there does not seem to be an easy solution for editing and uploading audio. If pushed Audioboo could be used then the resulting uploads could be edited by a second person. That unfortunately takes the editorial control away from the journalist and requires additional communication between remote workers where simple communication may itself be limited. Ultimately i’d like to field test the iPad mini and iphone 5, connected with a mifi and charged with a solar panel. I’d like to head out into the wilds and share photos, video and edited audio. If I could use and offline recorder like the Zoom H2n then even better. I have tools that have proved themselves to me over the last few years and Audioboo plays a huge part in that tool kit. One app posting location, audio and a photo. I shall continue experimenting and pass on this conversation to Audioboo. Cheers. thanks for taking the time to read/listen. It would be great to have an “Instagram app for audio”. A place where you could both edit and share the audio on the web. 1st Video edits audio and can be sent to SounCloud but the interface is less than “mac” style. I guess audio is different to adding filters. I wonder if this is possible with the current Apple system configuration to access native audio files. I’m not sure an Instagram for audio would nurture great audio. Especially if it were adding ‘effects’. I do see what you mean though. If Audioboo enabled you to post to a channel that was not your normal RSS feed and a public space it would certainly nurture artistic and casual snippets. First I’d like a where to share choice on the posting page. I.e. twitter etc. Audioboo already is the YouTube of audio for me. I’m looking forward to when I can use the iPad for listening. The iPad app out now is aching for an update. Search would make it ten times the app it is now. How are you getting video onto it? Are you just filming with the iPad or are you using one of the attachment cables to upload via memory card? Every time I tried that with my iPad I was limited to uploading SD content – couldn’t even get 720p on there. Most frustrating. I use both the front and rear camera and use the sd card and usb camera connection kit. I have shot 720p at 60 frames a second and uploaded into the ipad. I try to use .mov as the format to avoid complications. Ta for that. Was using a Kodak Zi8 but no joy importing the higher-spec 720p stuff (love the Kodak due to the external mic). Might play about with some other things though. Tried to get a Mini over Christmas. Bad move! Family now has an ipad 2. I think I will give the Nexus 7 a whirl as many folks are giving this tablet the thumbs up including Katie Moffat among others. My experience with the Mini is similar to your’s. I’ve owned iPad 1, 2, and 3 and have gotten more use from my Mini than all three combined. It all boils down to form factor. The iPad 3 was just large and heavy enough to discourage casual, day-to-day use. The vast majority of the time, I’d just reach for my MacBook Pro rather than use my iPad 3. Both involved laps, after all. But I find myself reaching for my Mini all the time. In my opinion, it’s what the iPad should’ve been from day one.